As rival protesters filled the streets of Sana'a for the seventh consecutive Friday, Saleh pledged to hundreds of thousands of his supporers that he would reject and offers of mediation from foreign powers, including GCC countries such as Qatar. This statement came as Saudi Arabia offered to broker a deal among the government, political opposition, and youth protesters for a peaceful transfer of power. 'Our power comes from the power of our great people, not from Qatar, not from anyone else. 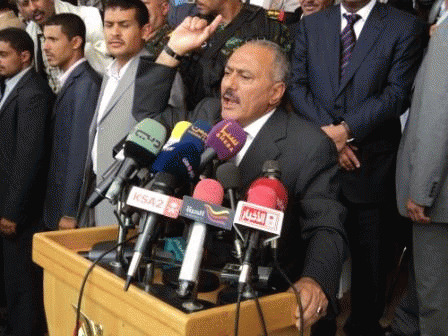 This is blatant interference in Yemeni affairs,' said Saleh in a speech on Friday, 8 April. While citizens in the capital wait nervously, anticipating clashes between rival military groups and protesters to break out, President Saleh has already lost total control of several other remote governorates of the country. In Sa'ada, Yemen's troublesome northern governorate on the Saudi border, rebels have driven out the governor and replaced him with Faris Mana'a, loyal to Yemen's revolution. "Everything is under our control," said Mana'a, "government employees and security forces are operating as normal in this liberated territory." Home to Yemen's Houthi rebellion, Saleh has fought six wars in Sa'ada throughout the past decade. As the rebellion threatened to bleed into Saudi Arabia's Asir region, home to people who still self identify as Yemeni, the kingdom's military might was unleashed against the rebels. Revolutionary governor Mana'a is confident that the Saudi military does not want send troops back into Sa'ada. Jeb Boone is a freelance journalist based in Sana'a, Yemen. He regularly contributes to the Sunday Telegraph, the Independent, the Guardian's Comment is Free and Global Post. Boone is also the managing editor of the Yemen Times. Anonymous, Wikileaks joins Yemen's "Day of Rage"